Most of the getaways our family takes for much needed “rest and relaxation” are based around races. Doing a running race, bike ride, or triathlon is a great way to see a new area. Last week we went on a little race-cation to a nearby mountain town called Chiang Dao. Incredibly beautiful place. 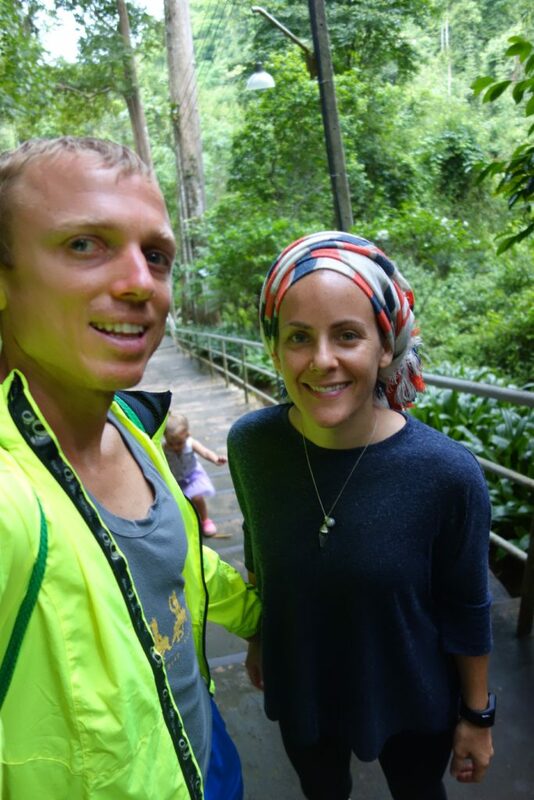 It was our first time there and we loved all the incredible stuff available to do outdoors and in nature, including a 510 step climb to a nearby Buddhist temple! 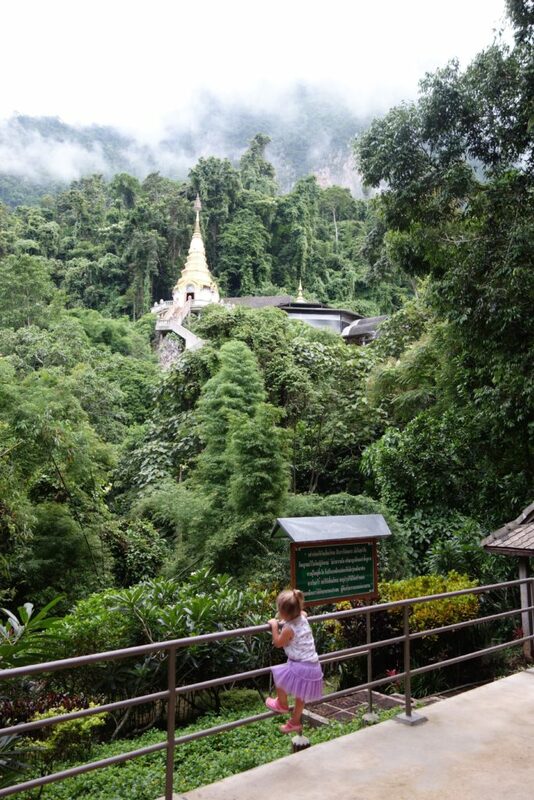 Many temples in Thailand are located on the top of a mountain and have stairs going up to them. We love finding these places! 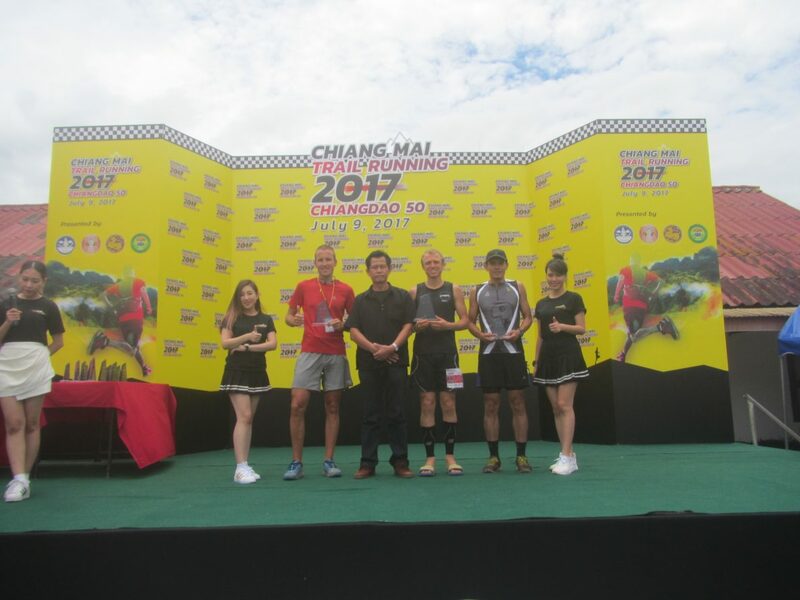 While in Chiang Dao I competed in the inaugural Chiang Dao 50, a 50 kilometer (actually about 52K) trail run going up to the top of a mountain and then turning around and running back to the start. The race went almost perfect, despite being only 2 weeks after the Sukhothai Marathon. One of the exciting/enticing things about trail running is the mystery of the unexpected. This race was no exception. I felt great and took an early lead up the mountain being paced for several miles by two different herds of water buffalo at different points. The path was covered in cow patties, caterpillars, etc. The 2nd place guy, a Thai runner friend from Chiang Mai, caught up with me at the top just before the turnaround at halfway. At the turnaround I was about 30 seconds ahead. I took off down the mountain and gained a lot of time on him, probably 10-15 minutes. With about 4k left in the race it was flattening out again and came to a T-junction. The arrow sign guiding the course had fallen partially and I couldn’t tell which way to go. I ended up going the wrong way for about 2k before coming to a dead end. Just as I turned around a policeman on a motorbike pulled up and confirmed my wrong direction. I was so frustrated with myself that I had made such a huge mistake. At this point I should have been almost finished, but now I had to run back (mostly uphill) to the spot where I took the wrong turn. It was getting hotter, I had no water left, and was tiring quickly now – especially due to the frustration of my error. When I got back to the spot there were a number of race staff there telling me I was in 2nd place. The policeman was kind enough to ride beside me on his motorbike for several miles until I got close to the finish line. I ended up finishing 2nd overall, first in my age group, about 6 minutes behind my friend, even despite slowing down tremendously after getting back on track. Ended up running almost 56k (the course itself was a little long). Very frustrating and humbling knowing that I had the race easily won and ended up losing after working so hard for so many hours. But, there are always lessons to be learned and things to be appreciated no matter the circumstances. Thankful for the opportunity to run and be in the mountains and enjoy the beautiful scenery. Many thanks to ProPro and Food4Thought for your support. Proper nutrition with nourishing and healing foods such as ProPro bars and meals from Food4Thought are definitely necessary for a quick race recovery and preparation for future races. Thanks to my family (Amanda Elliott, Paxton, and Piper) for your continual support and encouragement and for joining me in some of my workouts.